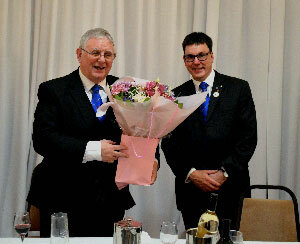 Peter Hainsworth was installed into the chair of the Phoenix Lodge of Installed Masters No 9206, to become the 33rd WM. 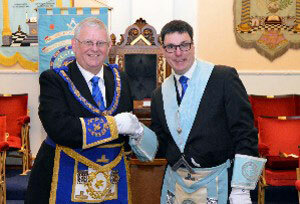 For the ceremony, the lodge was honoured by the presence of Assistant Provincial Grand Master Stewart Seddon. Stewart Seddon (left) congratulates Peter on being installed into the chair of King Solomon. Peter and Stewart were among more than 80 members and guests attending the installation meeting at Leyland Masonic Hall and included a Past Assistant Provincial Grand Master William Huck and the Group Chairman of Leyland Group and the Vice Chairman of Chorley Group, Chris Blackwell and Peter Allen respectively, along with many other grand and acting Provincial grand officers. On concluding the ceremony, Stewart Seddon, who himself is a past master of Phoenix Lodge, brought the greetings of the Provincial Grand Master Tony Harrison and congratulated Peter on attaining the chair, along with all the brethren who had taken part in what he described as an excellent ceremony, making special mention of the installing master Bryan Hoarty for the excellent way he conducted the ceremony and making it such a great and enjoyable occasion to watch and be part of. Stewart was then presented with cheques for £250 to St Catharine’s Hospice, £250 to Derian House, £400 to Masonic Charitable Foundation and £100 to North West Blood Bikes, a grand total of £1,000. Stewart went on to thank the brethren sincerely, on behalf of the final recipients of the donations for their generosity. Peter Hainsworth accompanied by his principal guest Stewart Seddon, immediate past master, Bryan Hoarty and the other grand and acting Provincial grand Officers, plus group officers.